More than 13.000 new jobs, the delivery of 534 planes by Airbus and a turnover of € 38,5 billion in 2011, the French space and aeronautics industry is in a good mood. The future looks bright for one of the most profitable and internationally oriented sectors of France. The positive outlook is part of worldwide interesting developments in the aeronautics sector. According to a study of Euler Hermes, the delivery of large machines will increase with another 10% in 2013, after an expected increase of 14% in 2012. On the long term, the French constructor Airbus expects that 28.000 new airplanes will be needed by the year 2031 thanks to e.g. 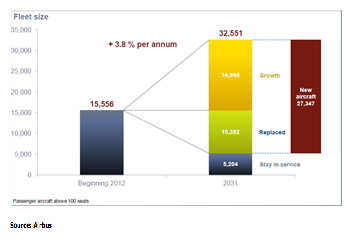 the upcoming markets, increasing internationalization and a worldwide population growth. Currently, the success of Airbus already puts its subcontractors under pressure. Because of an increase in orders, SMEs and even large suppliers lack financial as well as human resources to keep up with the order frequency. The completeness of the offered aeronautics and aerospace materials is an important Unique Selling Point of the French industry, which is besides the USA the only country who can claim this position. A large amount of important manufacturers are located in France, among which Airbus, ATR, Dassault Aviation, Eurocopter, Safran, SNECMA and Thales. The high concentration of manufacturers, subcontractors and research centers in the South of France and the Paris region with the existence of competitiveness clusters such as the Aerospace Valley around Toulouse, stimulates innovation and growth in the sector. The competitiveness of the French is demonstrated by the high export rate of 77% of the total realized turnover. This performance could not be realized without international cooperation. Besides collaboration on the contractor level (for instance EADS and ATR) also the supplier bases of manufacturers are highly international oriented. 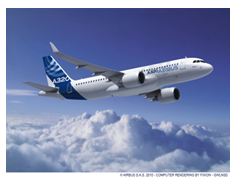 Airbus works for instance with suppliers from 30 countries. Another import ant factor for the success of the French industry is the investment of 17% of turnover into Research and Development. The focus on R&D is expected to intensify with the interest in more environmentally friendly and quieter planes. The need for innovation is also reflected in the significant investments in the production means of this French industry, representing every year about € 1 billion. Safran for example, as an important manufacturer for the aerospace, defense and security market, has recently announced to proceed its large scale investments for the period of 2013-2016. Not only a high level of investments is needed to keep up with the fierce worldwide competition of in the first place Boeing and Embraer. This dynamic sector requires as well high performance suppliers to assure the delivery of high quality and cost competitive end products. Are you a subcontractor to the aeronautics or aerospace industry and do you wish to come into contact with decision makers in this interesting sector, do not hesitate to contact us for more information.